This book offers a new direction for the study of contemporary Islam by focusing on what being Muslim means in people’s everyday lives. It complements existing studies by focusing not on mosque-going, activist Muslims, but on how people live out their faith in schools, workplaces and homes, and in dealing with problems of health, wellbeing and relationships. As well as offering fresh empirical studies of everyday lived Islam, the book offers a new approach which calls for the study of ’official’ religion and everyday ’tactical’ religion in relation to one another. It discusses what this involves, the methods it requires, and how it relates to existing work in Islamic Studies. 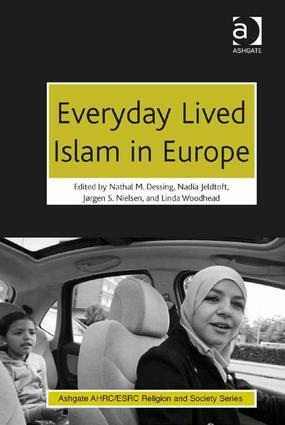 Contents: Introduction, Nathal M. Dessing, Nadia Jeldtoft, Jørgen S. Nielsen and Linda Woodhead; Part 1 Studying Everyday Lived Islam in Theory and Practice: Tactical and strategic religion, Linda Woodhead; The hypervisibility of Islam, Nadia Jeldtoft; How to study everyday Islam, Nathal M. Dessing. Part 2 Case Studies: Bihishti Zewar: Islam, text, and the daily lives of Gujarati women in Leicester, Raana Bokhari; Elastic orthodoxy: the tactics of young Muslim identity in the East End of London, Daniel Nilsson DeHanas; Spirituality and emotions: making a room of one’s own, Nadia Jeldtoft; ‘School Islam’: lived religion in the context of a secular public institution, Sidsel Vive Jensen and Lene Kühle; Experiencing Islam: narratives about faith by young adult Muslims in Malmö and Copenhagen, Jonas Otterbeck; Daily life and conflict in the Albayzín neighbourhood of Granada, F. Javier Rosón; Illness, healing and everyday Islam: transnational lives of Somali migrant women, Marja Tiilikainen. Concluding reflections: everyday lived Islam and the future of Islamic studies, Jørgen S. Nielsen; Index. Nadia Jeldtoft is Research Assistant at the Center for European Islamic Thought, Copenhagen University. Together with JÃ¸rgen S. Nielsen she is the editor of Contexts and Methods in the Study of Muslim Minorities: Visible and Invisible Muslims (Routledge, 2012). Nathal Dessing is University Lecturer in Religious Studies and Islamic Theology at the Leiden University Institute for Religious Studies (LUIRS). She is the author of Rituals of Birth, Circumcision, Marriage, and Death among Muslims in the Netherlands (Peeters, 2001) ’Thinking for Oneself? Forms and Elements of Religious Authority in Dutch Muslim Women's Groups’, in Women, Leadership, and Mosques: Changes in Contemporary Islamic Authority, edited by Masooda Bano and Hilary Kalmbach (Brill, 2012). JÃ¸rgen S. Nielsen is Professor of Islamic Studies at the Faculty of Theology, University of Copenhagen, where he leads the Centre for European Islamic Thought. Recent publications include Muslims in Western Europe (Edinburgh University Press, 1992; 2nd ed. 1995); and Muslim networks and transnational communities in and across Europe, ed. with S. Allievi (Brill, 2003). He is Chief Editor of the Yearbook of Muslims in Europe, and General Editor of the series Muslim Minorities. Linda Woodhead is Professor of Sociology of Religion at Lancaster University, and Director of the Â£12m AHRC/ESRC Research Programme on Religion and Society. Publications include Religion and Change in Modern Britain, ed. with Rebecca Catto (Routledge, 2012); A Sociology of Religious Emotion, with Ole Riis (OUP, 2010); The Spiritual Revolution: Why Religion is Giving Way to Spirituality, with Paul Heelas (Blackwell, 2005); An Introduction to Christianity (Cambridge University Press, 2004). Her edited and co-edited books include Religions in the Modern World 2nd edition (London: Routledge, 2009); Congregational Studies in the UK, (Ashgate, 2004) and Religion in Modern Times (Blackwell, 2000).